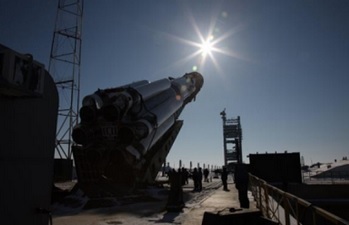 International Launch Services (ILS) successfully utilized its Proton M rocket to launch the Eutelsat-9B communications satellite on a multi-hour flight to its transfer orbit. 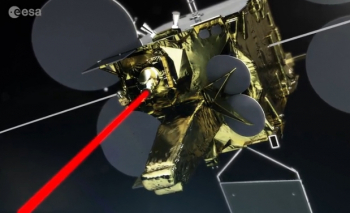 The satellite includes a hosted Data Relay System payload for the European Space Agency. 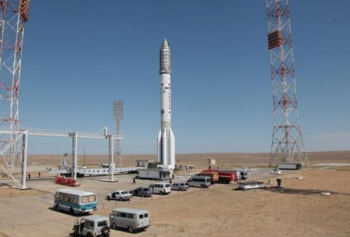 Launch from the Baikonur Cosmodrome in Kazakhstan was on schedule at 22:20 UTC on Friday. The Proton booster used to launch the Eutelsat-9B satellite is 4.1 m (13.5 ft) in diameter along its second and third stages, with a first stage diameter of 7.4 m (24.3 ft). The overall height of the three stages of the Proton booster is 42.3 m (138.8 ft). It has suffered its fair share of problems, but successfully conducted a Return To Flight (RTF) mission in 2015, following the May 16 failure that resulted in the loss of the MexSat-1 (Centenario) communications satellite on what was supposed to be a multi-hour flight to its transfer orbit. This was ILS Proton’s opening mission of the year, with the rocket utilizing a 5-burn Breeze M profile. The first three stages of the Proton used a standard ascent profile to place the orbital unit into a sub-orbital trajectory. From this point in the mission, the Breeze M upper stage performed planned mission maneuvers to advance the orbital unit first to a circular parking orbit, then to an intermediate orbit, followed by a transfer orbit, and finally to a geosynchronous transfer orbit. Separation of the EUTELSAT 9B satellite occurred approximately 9 hours, 12 minutes after liftoff. EUTELSAT 9B is a high-capacity Ku-band satellite that will take Eutelsat’s 9 degrees East position to increase the companies capability. Capacity will be spread across five footprints, with frequency reuse optimising overall bandwidth. The satellite will address high-growth digital TV markets through one pan-European footprint delivering wide coverage and four regional footprints. The Airbus Defence and Space satellite sports a payload of 56 Ku-band transponders and has an anticipated service life of 15 years. 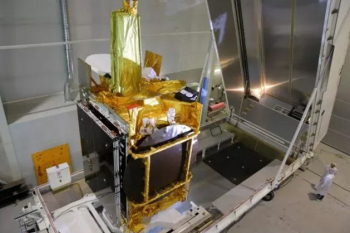 EUTELSAT 9B also hosts the first data relay payload for the European Data Relay System (EDRS), implemented through a Public Private Partnership (PPP) between ESA and Airbus Defence & Space. EDRS is ESA’s most ambitious telecom program to date, creating the means for an entirely new market in commercial satellite communications. Dubbed the ‘SpaceDataHighway’, EDRS will uniquely provide near-realtime Big Data relay services using cutting-edge laser technology. It will dramatically improve access to time-critical data, aiding disaster response by emergency services and maritime surveillance. The first node, called EDRS-A, will begin relaying information this summer from its first customers – the ESA/European Commission Copernicus Sentinel-1 and -2 satellites. 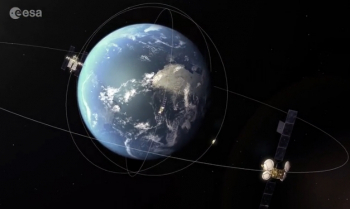 From that point on, ESA and Airbus will use the first and future EDRS nodes to increase the time low-orbiting satellites, the International Space Station and unmanned aircraft can send data to Earth from intermittent to near-continuous. In-orbit tests will begin on the EDRS laser payload three weeks after Friday’s launch. This opening ILS Proton launch of the year marks the 92nd ILS Proton mission, becoming the 11th Eutelsat and 21st Airbus-built spacecraft to ride uphill on the Russian workhorse. (Images via ILS and ESA).